When I was young, I was often reprimanded for breaking gender stereotypes. I didn't like the idea that I was not allowed to do things because I am a female. I resent being told to specialize in feminine roles --- culinary work and household chores that would prepare me for the homemaker role once I get married. My family was baffled as I am. I don't fit the definition of a submissive female. While I dream of having my own family then, my eyes were set towards something bigger. I want more. The fearlessness in me wants to break free. Happiness varies in people and mine is going over the mother role. I refuse to be bound in the house as a housewife. I want my life to be filled with purpose. I studied hard, immersed myself in books and went on to prove myself. I want what the world has to offer. My life became more meaningful in the company of like-minded individuals I have met along the way. I felt a sense of belonging knowing that I was changing lives for the better and touching the lives of those within my circle of influence. I am thankful for the courageous women who have supported and mentored me. Life doesn't come with a manual and so having supportive people around me helped a lot. Now at midlife with a family of my own, I find fulfillment in supporting women and advocacies. My life may have been rough, but my participation in things that matter to me made it all worthwhile. Living life mindfully and networking with women fills my need to create more happiness in my life. I immediately said yes to a Women Empowerment session upon receiving the invitation. Women's Month is celebrated every March. And in celebration of International Women’s Month this year, Gastronomy By Joy invited us to join in Women Empowerment (WE), the first in a series of events, wherein women will be encouraged to live their dreams and live a happier life. Women movers and ordinary women will be giving talks and will be sharing insights on how to create socio-equality in their own homes. These series of events will tackle money matters, wealth management and other things that matters to women. WE seeks to tap one's potentials, be a blessing to others by empowering women to help improve each one's lives and situations. Empowering women to participate fully in economic life will help them realize that they are also capable of doing everything. 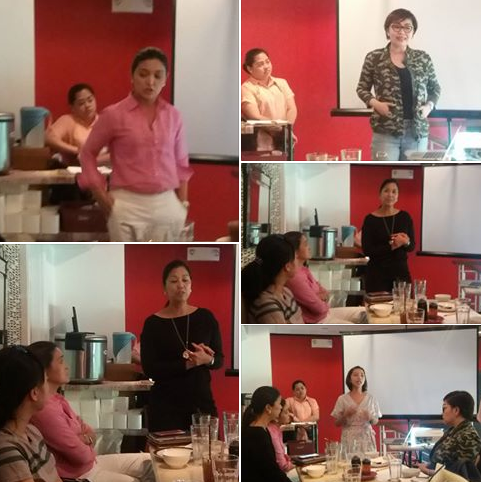 A talk on Women and Money was given by Ms Rowena Suarez, a financial advisor. She shared her knowledge on financial uncertainty, poverty, poor health, personal insecurities and gaining financial freedom among others. Celebrity Chef Michelle Adrillana of Stew Comfort Food and Flavors of Fire plus Chef Jill Busuego of Delicioso shared how they started in their own food businesses and the how they overcame the setbacks in pursuing their passions. All these women are inspired to help other women by sharing their knowledge. I have learned a lot from these inspiring women and I look forward to another #WE gathering. Do follow @WEManila, @Gastronomy-allaboutfood and @JustaskRo FACEBOOK pages for updates. Don't miss out on this opportunity to be with like-minded women who serve the same purpose as you.